The last full new book, this distinctive and inimitable collection is the ultimate must-have title for Douglas Adams fans. Here is Douglas Adams' indispensable guide to life, the universe and everything. This sublime collection dips into the wit and wisdom of the man behind The Hitchhiker’s Guide to the Galaxy, uncovering his unique comic musings on everything from his school-trousers to malt whisky and from the letter Y through to his own nose, via atheism, hangovers and fried eggs. 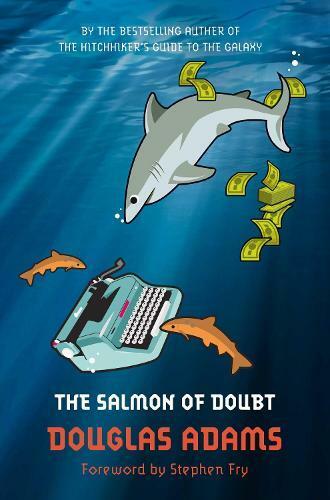 Including short stories and eleven chapters of a Dirk Gently novel that Douglas Adams was working on at the time of his death, The Salmon of Doubt is for fans and new readers alike. These hilarious collected writings reveal the warmth, enthusiasm and ferocious intelligence behind this most English of comic writers; a man who was virtually an unofficial member of the Monty Python team. Douglas Adams on his passion for P. G. Wodehouse, The Beatles and the perfect cup of tea alone make this a must-have collection and a remarkable sign-off from one of the best loved writers of all time.